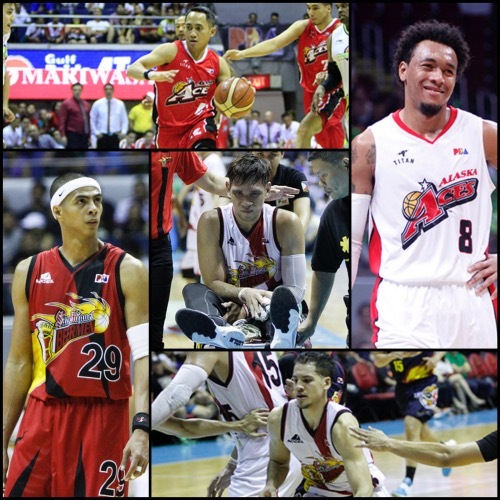 The San Miguel Beermen and the Alaska Aces aren’t just the two best, winningest teams this conference. They are the two winningest franchises in PBA history. Oh, and let’s not forget that they fought a 7-game classic in last year’s PHL Cup Finals, where the Beermen prevailed by the skin of their teeth in Game 7. Alaska met SMB again in the Govs’ Cup Finals only to be denied a second time. There’s no love lost here. There’s as much bad blood as one can imagine. It’s the grudge match to end all grudge matches. It’s World War 3 between Alaska and San Miguel Beer. - SMB looked like they were on the ropes after the first 3 games of their series against ROS. The Beermen didn’t have their usually sharp execution, and they didn’t seem as hungry as the Painters. That all changed in the next three games, though, as the Beermen completely turned things around. June Mar Fajardo, of course, was a huge part of that, but a lot of other guys stepped up, too, like Arwind Santos, Marcio Lassiter, Chris Ross, and Gabby Espinas. Against the #1 seeded Aces, however, the Beermen cannot afford to fall behind. THey have to take the initiative. - The Spider-Man needs to show up in the Finals. And I don’t mean have or two good games. He has to be at his best in EVERY GAME. He has to show ALA that there are no das-off from being entangled in the spider’s web. Santos season stats: 15.1ppg, 8.6rpg, 1.8bpg, 2.3 triples per game. Last game vs ALA: 10pts, 7rebs, 3asts, 1stl, 2blks, 2 triples. - Without a doubt, Lassiter is one of the best SGs in the league today, but since he is teammates with a reigning MVP and a former MVP, Lassiter usually is content being the third, sometimes fourth, option. Not this time, though, as the former Gilas sniper must assert himself so SMB can somewhat neutralize the explosive wingmen of the Aces. Last game vs ALA: 0pts, 1reb, 1ast, 1stl. - One thing SMB has done so well so far this season is getting down dirty and really taking the fight to their foes. That’s whether through put-backs, hustle plays, or transition scores. Against one of only two teams to defeat them in the elims, the Beermen have to play things tight. SMB will have to “take out the thrash” and get down and dirty. - SMB leads the league in 2nd chance pts with 14.6per game. - They have the biggest rebound difference in the season so far -- outrebounding their opponents by nearly 6 per game, and they have effectively used this to get their way. - In contrast to SMB, ALA didn’t really have go through the wringer in their semis series opposite GLO. The Batang Pier won Game 1, yes, but ALA just railroaded them in the next four games, asserting their might while also exposing GLO’s inexperience. For much of this season so far the Aces have been the most consistently good team, and they are expected to continue riding high on their current crest of momentum as they collide with SMB. - Vic Manuel has been ALA’s leading scorer for its first 6 games, and he should continue being the focal point of this team’s offense here in the Finals. Manuel isn’t the tallest guy on the floor, hut his girth and his plethora of low post moves are worth marveling at. This may be compounded by the fact star center June Mar Fajardo looks to be injured, and if this is indeed the case, Manuel should have a bigger impact in this series. - Calvin Abueva is the type of player who stares adversity in the face and shrugs with the confidence of an untamed beast who knows he has his prey right where he wants it. That’ll be his demeanor entering this series as ALA tries to get payback for losing to SMB in two Finals series last season. Abueva, of course, has been having a banner season, putting up career-highs in scoring and rebounding. The championship series is the opportune time for the full fury of the Beast to be unleashed. - The thing that makes ALA so good is the fact they have #NoChill on both ends of the floor. The Aces are the top scoring team in the league, and they are second-best defensive team as well, outscoring teams by an average of 9.1 points. That means their opponents are given hell in practically every game. Needless to say, they’ll need to continue doing that in this series. - Point guard play will be very key in this series. The duo of Alex Cabagnot and Chris Ross is the more explosive pair, but the duo of JV Casio and RJ Jazul is the more consistent. The pace of this game, and perhaps this series, will rest on the shoulders of these playmakers, so their level of play will be significantly critical in determining their team’s fortunes. - The gutsy Alaska Aces took on the league’s giants, the San Miguel Beermen, and stood tall in the end, 103-97, to remain in the hunt for a top-two finish in the SMART BRO PBA Philippine Cup’s elimination round last December 16. The Aces needed to survive a phenomenal performance from reigning back-to-back PBA MVP June Mar Fajardo, who finished with a career-best 43 points and 20 rebounds, but somehow got the job done. Alaska put an end to San Miguel’s seven-game winning streak and handed the defending champions, who have been at No. 1 for most of the conference, just their second loss in 11 games this conference. Sonny Thoss scored 18 points, Calvin Abueva added a double-double with 17 points, 11 rebounds and five assists while Chris Banchero chipped in with 17 of his own to lead Alaska. - Potentially losing June Mar Fajardo to a serious injury will severely impact SMB’s chances in this game. He’s the league MVP, the leading BPC candidate, and the focal point of SMB’s style of play. If, indeed, he is lost to injury, whether not-so-serious or very serious, SMB will have to make adjustments on a big scale. Needless to say, Arwind and Marcio will have to step into bigger leadership roles, while Alex Cabagnot, Chris Lutz, Ronald Tubid, Gabby Espinas, etc. will have to muster their talents and step up as well.